Create a thread pool in java without using executor framework. We will use blocking queue to implements a thread pool. 1. What is thread pool in java? Thread pool is collection of threads, which are created to perform certain tasks. Thread creation is costly IO operation. It’s not advisable to create & destroy thread(s) every now and then. It’s recommended to use pool of threads as per application’s need. We will implement custom thread pool using following classes. BlockingQueue: BlockingQueue class will be used to store tasks. TaskExecutor: TaskExecutor class is capable of executing the task. TestTask: The task or operation, which we want to execute. TestThreadPool: TestThreadPool class creates the tasks and submit tasks to thread pool. Task Producer will generate the task. 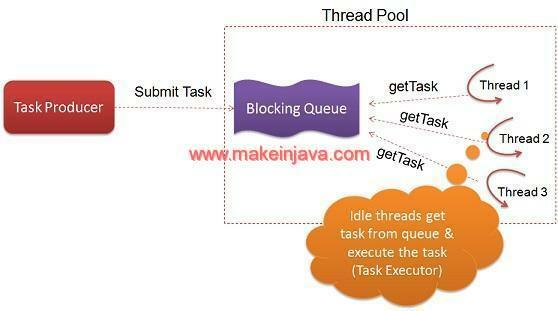 We have used the custom blocking queue implementation to demonstrate the thread pool in java. The ThreadPool encapsulates the custom BlockingQueue class and TaskExecutor class. Threadpool class creates numbers of TaskExecutor instances. ThreadPool class exposes one method submitTask. submitTask method will be called by task generating program, to submit a task to threadPool. TaskExecutor class implements Runnable interface. TaskExecutor class executes the task. BlockingQueue simulates the blocking queue implementation. We have used LinkedList as underlying data structure. dequeue : This method takes (pop) the task from the queue. TestTask simulates the task to be submitted to thread pool. TestThreadPool class containing main function to test the thread pool.